(Newser) – Move over, Mars: Titan could be the best place for a human colony. 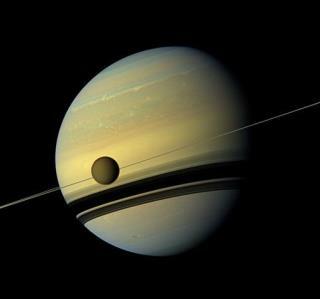 As far as extraterrestrial bodies go, Saturn's largest moon is surprisingly like Earth, with a dense atmosphere that could shield delicate earthlings from radiation, reports New Scientist. Titan's candidacy as a settlement isn't new, but a fresh analysis shows the yellow moon has valuable energy sources that could power a settlement. Per Science Alert, Amanda Hendrix and Yuk Yung write that once propulsion issues of getting there are tackled, Titan is the "optimal location in the solar system for an off-Earth human settlement." Some 808 million miles away, self-sustainability on Titan is key. Robots and even humans could one day make nuclear power by using radioactive decay there. The scientists say solar power could come from a US-sized solar farm, even though Titan is nearly 10 times farther from the sun than Earth is. we are EARTH BOUND, we humans are GOING NOWHERE. The USA certainly is NOT DOING SPACE while we fund the Israelis who do NOT DO space, we PAID the US gov. for cities on our moon and GOT SCREWED! Bad idea, methane doesn't burn on its own where will the oxidizer for the rockets come from? Thick atmosphere that's not breathable isn't really helping. Radiation may still be higher than what humans can tolerate for long periods. Wind and wave, well if we don't master it on earth then little chance of mastering it on a inhospitable moon. If it's got a lot of nuclear fuel then how are humans going to survive the radiation? About -160 degrees Celsius? Yea it might be most hospitable place in the solar system for colonization but it's still not good enough. the headline totally threw me. i thought it was an article about efforts to reduce crime in chicago.